I don’t know where my manners went. How could I have forgotten to wish you a Happy National Coffee Day? How selfish of me. And rude. And mean. Okay, I’m just being dramatic here. But, seriously, Happy Belated National Coffee Day. How belated exactly? Fourteen days. National Coffee Day was on September 29th. Better late than never, right? If it makes you feel better, I didn’t really celebrate. In fact, I only had one cup of coffee that day, which is much smaller than my usual amount. Saddening, I know. This is why we (yes, you and I…no one wants to celebrate alone) need to sit down, clink are forks together, and dig into some No-Bake Mocha Cheesecake. Or, should I say some No-Bake Mocha Cheesecake with a Kona Coffee Shortbread Crust topped generously with homemade whipped cream and mocha syrup. Try saying that five times fast. It’s a mouthful. A delicious mouthful. A coffee infused mouthful. But, still, a little long. Hence the shorter name for this dessert. Starting from the bottom, we have a Kona Coffee Shortbread Crust. Sounds like a lot of work to make, huh? It’s not. Trader Joe’s has these amazingggg Kona Coffee Creamy Half-dipped Shortbread Cookies, which you simply have to crush up and bam snap clap (just go with it) you have a crust for your cheesecake. Next up, we have the Mocha Cheesecake. 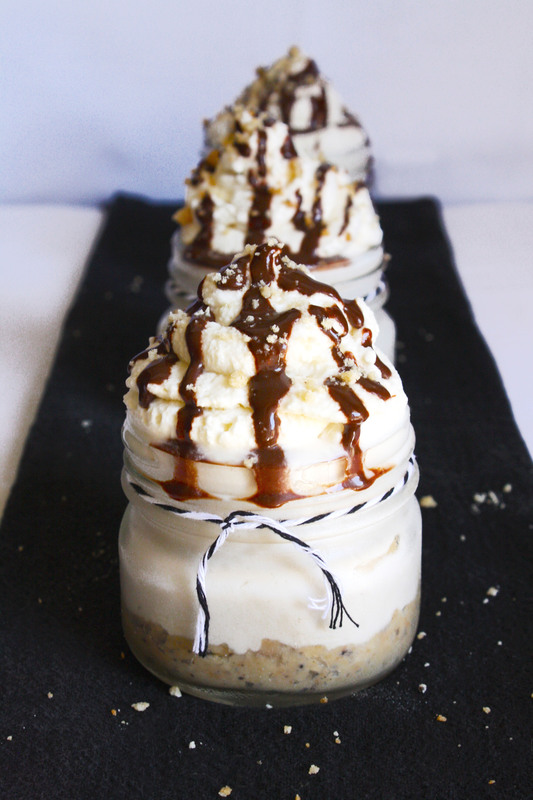 The mocha flavoring is very subtle and doesn’t overpower the creamy taste of the cheesecake in any way. In fact, you don’t taste the mocha until you swallow your first bite. The flavor is easily adaptable too—want more mocha? Add more of the mocha coffee. Need it to be sweeter? Add more sugar. Want a hint of vanilla? Add some vanilla extract. Play with the taste of the cheesecake until you love it. 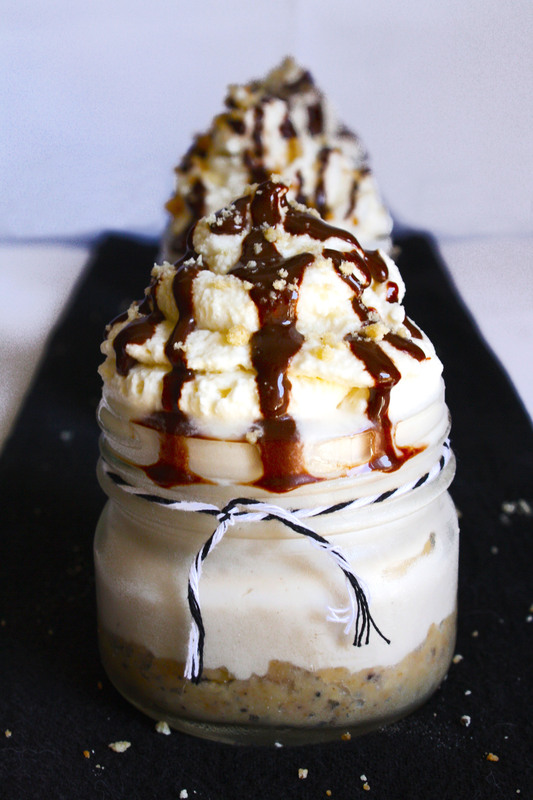 Lastly, we have the optional, but highly recommended toppings of homemade whipped cream and mocha syrup. This isn’t a very sweet dessert, so adding the whipped cream definitely kicks up the sweetness a little bit. The syrup tastes exactly like mocha—a little chocolate, a little coffee, and a little bit bitter—and adds the perfect final touch to this dessert. As a whole, you definitely taste the coffee in this sweet treat. Which, if you think about it, is the ideal way to honor National Coffee Day…no matter how belated we may be. In a food processor, pulse the Kona Coffee Shortbread Cookies until finely crumbled–I added butter to help combine the crust, but it ended up getting a little hard (still delicious, but you had to stab it with your spoon for it to crumble) after the cheesecakes chilled in the fridge, so I suggest not to use butter, or if the crust needs help combining, add just a little bit of melted unsalted butter to help. Divide the crumbles into each mason jar equally and press into the bottom. Set aside. In a stand mixer with a whip attachment, whip the heavy cream until stiff peaks form. Scrape into a separate bowl (you can reserve half a cup to use as a garnish on the cheesecakes or you can make fresh whipped cream after the cheesecakes have chilled, up to you!) and set aside. Using the same bowl you whipped the heavy cream in, beat the cream cheese until smooth. Mix in the sugar, mocha, and vanilla (if you decide to use it) until combined–the taste is up to you, if you want it to be more mocha flavored add more of the mocha coffee, if you want it to be sweeter add more sugar, or if you want a hint of vanilla add some vanilla extract. Using a spatula fold the whipped cream into the cheesecake mixture until just incorporated. 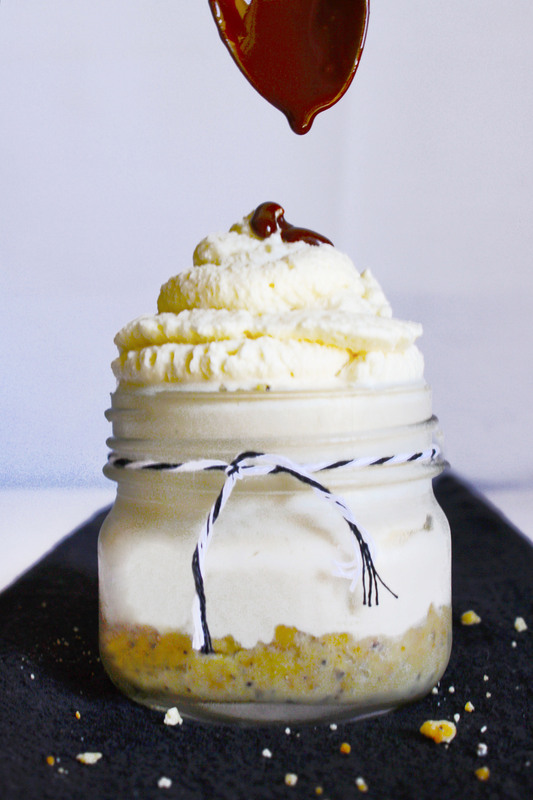 Spoon or pipe the cheesecake mixture evenly into the mason jars, make sure to smooth the tops. Let chill for two hours in the fridge. 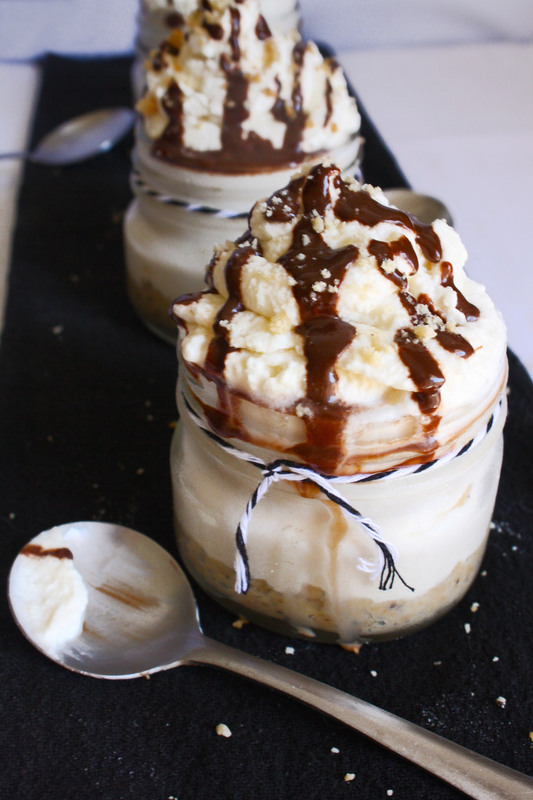 While the cheesecakes are chilling, make the mocha syrup. In a small saucepan, whisk together the mocha coffee, cocoa powder, sugar, and salt. Bring mixture to a simmer over medium-low heat, stirring constantly until syrup begins to thicken. Once thickened, remove saucepan from heat and stir in the vanilla. Let mixture cool down before pouring over the cheesecakes. 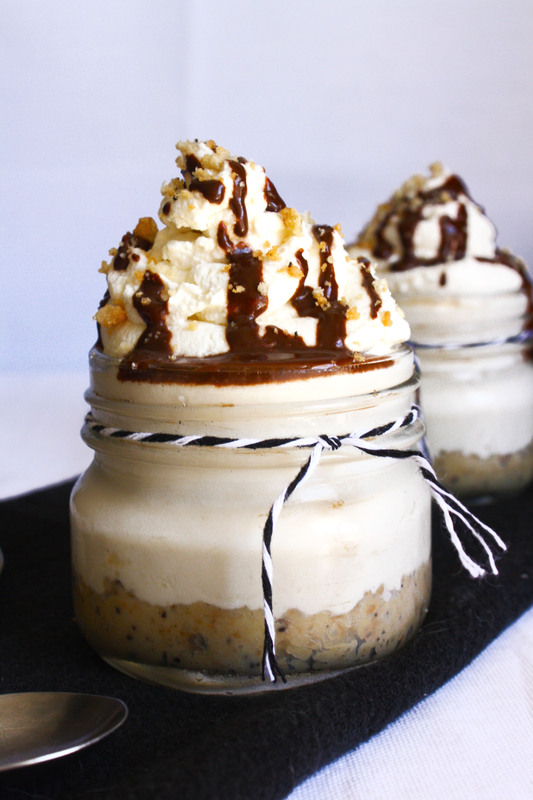 Top cheesecakes with reserved or fresh whipped cream and drizzle generously with mocha syrup.